The advent of CO2 injection and other EOR programs has led to even more need for the corrosion protection of water and CO2 distribution lines throughout the oil fields. Again, Permian Enterprises has met the need with an economical and effective corrosion prevention system. In 1987 Permian Enterprises developed and implemented a new external coating called Nap-Wrap. Throughout the years the designs and formulations were improved, and it is now known as Ryt-Wrap. Ryt-Wrap is one of the most popular external casing protections. 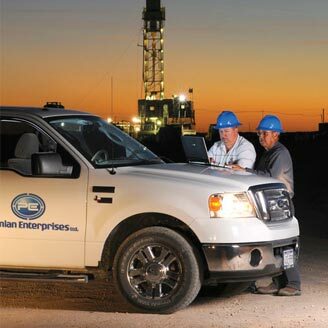 Over 30 million feet are in service with over 229 customers in the Permian Basin. Ryt-Wrap is one of the most widely used external coatings in the industry. In 2009 Permian Enterprises built a second Ryt-Wrap plant to keep up with the needs of its customers. In 1987, Permian Enterprises saw a new need and built a wrapping plant for the exclusive application of POLYKEN YG III external taping system. In 1990, equipment was added, and Permian Enterprises became the first coating plant to apply POLYKEN’s new SYNERGY heat-fused coating systems. In 2004 Permian Enterprises built a state-of-the-art internal plastic coating facility providing all the popular coatings necessary to protect tubulars in the harsh environment of the Permian Basin. Because of the volume of demand Permian Enterprises built a second internal plastic coating plant in 2007. Over the years Permian Enterprises has grown as the needs of our customers has grown. In addition to providing any service our clients might need, Permian Enterprises provides the kind of service that our clients expect. Since 1948, Permian Enterprises has cement lined in excess of 80 million feet of pipe, coated 30 million feet of Ryt-Wrap, and in the past dozen years has lined in excess of 24 million feet. Now, with this impressive record of success, Permian Enterprises continues to meet pipeline and tubing corrosion prevention needs of the oil and gas industry.